Home / About us / About us - SA / ​​About Sappi Southern Africa / ​Sappi and recycling / ​Why recycle? Few people routinely recycle partly because of the effort involved and partly because they don’t know how to recycle, but also because they’re not aware of the benefits of recycling. As resource and waste management becomes an increasingly pressing challenge for countries all around the world, the fact is that businesses, communities, families and individuals alike all need to commit to making sure that recycling becomes a part of their lives. In short, recycling significantly reduces the impact that manufactured materials have on the environment. For a start, recycling reduces the need for raw materials in the manufacturing process, and recycled products usually require less water and energy to produce than products made from virgin materials. Recycling also reduces littering, as well as air and water pollution, and creates both business opportunities and jobs. Remember to keep all paper for recycling clean and dry. For information on how to recycle other materials, please visit Paper Recycling Association of South Africa and National Recycling Forum. Recycling seems like such a hassle. Is it really important? Yes, it’s vital that individuals, households, communities and businesses all recycle to conserve natural resources, reduce littering, protect the environment, keep production costs down and reduce the need for landfill space. Honestly, how much garbage can there be? In developed countries, one to three kilograms of garbage is produced by every person every day, either directly or indirectly. No. All you need to do is to sign up for a recycling service in your area, and they’ll collect all your recyclables right from your doorstep. What does it mean when you say that paper is recyclable? Paper can be used again to make the same kind of product, reducing the amount of paper going into landfills and reducing the need for virgin or new fibre, which is derived from wood. Unfortunately not. Materials like cling wrap and long-life beverage cartons, amongst many other materials, can’t be recycled, and others can only be downcycled. This means they can’t be used for the same purpose twice, and that the second generation product made from the downcycled material can’t be recycled again. That is why recycling is just one aspect of creating a sustainable society. What are the other aspects? The three pillars of sustainability are REDUCE, REUSE, RECYCLE, meaning you should reduce your consumption, reuse whatever you can, and recycle what you can’t. Why do you refer to paper as a truly sustainable product? Unlike most other materials, especially other materials used for packaging, paper isn’t only reusable and recyclable, it’s also completely renewable. Plastic, nylon, polystyrene and other similar materials are made from petrochemicals, and the crude oil they’re derived from can never be replaced. The woodfibre needed for papermaking can be cultivated to meet ongoing needs. Trees also produce life giving oxygen and absorb carbon dioxide, one of the most common greenhouse gases contributing to climate change. Isn’t cutting down trees bad for the environment? Not if one grows them in a planned, responsible way as an agricultural product. Sappi doesn’t use trees from old growth or indigenous forests, only from Sappi-owned tree plantations or from suppliers where the timber can be traced to source. Sappi plants many more trees every year than it harvests to make paper and all of its tree plantations are certified by the international Forest Stewardship Council® (FSC®) for good environmental management. Is all paper made from trees? No, at Sappi we have production processes that enable us to use not only new or virgin fibre, but also fibre derived from recycled paper. This means we can reuse the original fibre up to seven times. Many of our papers also contain a high percentage of sugar cane fibre or bagasse, a byproduct of sugar production. What does it mean when you say that paper is biodegradable? Biodegradable products are products that are capable of being completely decomposed by bacteria or other biological means. Paper is fully biodegradable, leaves no toxic residue in the soil or water and biodegrades fully within four months in sea water conditions. Isn’t plastic and polystyrene biodegradable? No, plastic and polystyrene aren’t biodegradable, they’re photodegradable. That means, when it’s exposed to sunlight, they get broken down into smaller and smaller pieces. These pieces never biodegrade, though, and stay in the environment indefinitely. How long does it take plastic to degrade? In sea water conditions, it takes a PET (Polyethylene Terephthalate) cool drink bottle about 450 years to degrade. Doesn’t paper production use a lot of energy? All production processes require energy. At Sappi, up to 50% of the energy used in our production processes is generated internally from renewable sources, and we hope to be able to expand on this percentage in the future. No, paper is a classic material, and contemporary grades have many exciting features. In fact, using paper — especially for packaging purposes — is about moving with the times. It could be said that it is synthetic materials, which aren’t sustainable or biodegradable, which are now considered old fashioned. Isn’t it more ecofriendly to communicate electronically than to use paper? Not at all. Growing trees to make paper helps the environment rather than harming it. Without commercial forestry, greenhouses gases would be at least 5% higher worldwide than they are already. The information technology industry as a whole has a massive negative impact on the environment. Remember to look out for and to choose recycled paper products. Choose products such as tissues, paper towels and stationery that are made from or contain recycled fibre — check the label for details. In 2009, 58% of all recoverable paper consumed in South Africa was recycled. In comparison, the recovery rate for glass was 25%, for plastic 32% and for cans 67%. 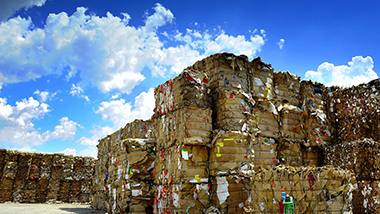 While most paper is recycled locally, many other materials are also shipped overseas for recycling or downcycling.